The Portneuf Watershed Partnership plans on providing an annual summer workshop focused on water quality monitoring, including data analysis using this website. Participating teachers will learn to collect chemical, physical and biological data from local streams, and analyze that data using the PWP website. PWP will provide teachers with ongoing support and equipment. For more information contact Hannah Sanger at hsanger@pocatello.us or (208) 234-6518. 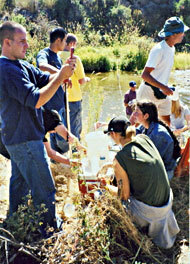 Monitor water quality in streams that can be waded into safely. Learn how to collect water quality data, and how to enter your data onto the PWP website so that scientists and other community members can better understand our local water quality. Citizen Scientist Commitment: Citizen Scientists must attend a training (FREE) with the PWP, and commit to a desired amount of monitoring. Who can be a Citizen Scientist? Youth/Scout groups, families, individuals, community groups, & you! Help reduce the amount of pollution that reaches the Portneuf River. Attach decals with the message "Dump no waste, drains to river” to storm drains in Pocatello and Chubbuck. Anything that is left on the street, goes straight to the Portneuf River or into our ground water (which is our drinking water)… and not to the Waste Water Treatment Plant. PWP has decals and instructions for you to use. For more information, contact Hannah Sanger at hsanger@pocatello.us or (208) 234-6518. Join the watershed wide effort to remove trash and debris from the Portneuf’s banks.